2. 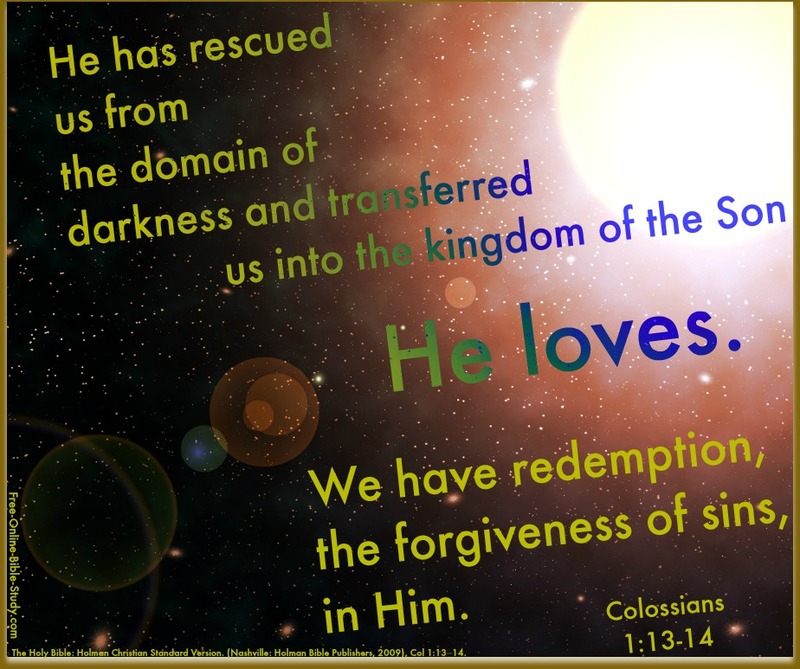 What 2 reasons are given for the author to thank God for the Colossians in verse 4? 3. Who previously taught the Colossians the truth of the Gospel? 1. From Colossians Chapter 1 verses 9, 10, and 11, list the things that Paul is praying will happen. 2. List the things God has accomplished on your behalf through Christ Jesus from Colossians Chapter 1 verses 12, 13, and 14. 1. List the attributes of Jesus Christ from Colossians Chapter 1 verses 15, 16, 17, and 18. 2. Have you ever wondered what Jesus Christ may have looked like? What do you imagine when you think of him? How do you see him in your mind? Only you can answer this question. But remember that what He looks like isn't as important as who you think He is - He is the Savior of the world - the Son of God. It's nice to imagine what He looks like but you will never see Him unless He is your Savior. 1. From Colossians Chapter 1 verses 21 and 22 identify what your condition was before and after you were reconciled to God through Jesus Christ. 2. Why is God or Jesus Christ represented by light? Why is evil or Satan represented by darkness? How are these symbols helpful to our understanding and an accurate representation of the truth? Light helps us see, to understand, to know the truth. Darkness hides the truth, confuses us and causes a lack of understanding. 1. Where was the town or city of Colosse? The city was in Phrygia, in the valley of the Lycus, about ten or twelve miles beyond Laodicaea and Hierapolis. The region is volcanic, and the earthquakes common to large portions of Asia Minor are here peculiarly severe. The tributaries of the Lycus carried calcareous matter which formed everywhere deposits of travertine, said to be among the most remarkable formations of this character in the world. “Ancient monuments are buried, fertile lands overlaid, river-beds choked up, and streams diverted, fantastic grottos and cascades and arches of stone formed by this strange, capricious power, at once destructive and creative, working silently and relentlessly through long ages. Fatal to vegetation, these incrustations spread like a stony shroud over the ground. Gleaming like glaciers on the hillside, they attract the eye of the traveler at a distance of twenty miles, and form a singularly striking feature in scenery of more than common beauty and impressiveness” (Lightfoot). The fertility of the region was nevertheless great. The fine sheep, and the chemical qualities of the streams which made the waters valuable for dyeing purposes, fostered a lively trade in dyed woolen goods. All the three cities were renowned for the brilliancy of their dyes. This verse does not imply a deficiency in Christ’s atoning sacrifice on the cross. Behind it stands a Jewish and early Christian conviction of a predetermined amount of suffering to be endured by God’s people before the consummation of the age. Paul saw his suffering on behalf of Christ as contributing to the sum total. 1. What is the mystery mentioned in verse 26 that was hidden for ages and generations? 2. Why was it necessary for God to hide the mystery? 7 No, we speak of God's secret wisdom, a wisdom that has been hidden and that God destined for our glory before time began. 9 However, as it is written: "No eye has seen, no ear has heard, no mind has conceived what God has prepared for those who love him"
10 but God has revealed it to us by his Spirit. The Spirit searches all things, even the deep things of God.